Franklin Street Works in collaboration with The Ferguson Library – Stamford’s public library, The Aspen Institute and New Haven artist, produced a site specific piece at the library with artist David Livingston. 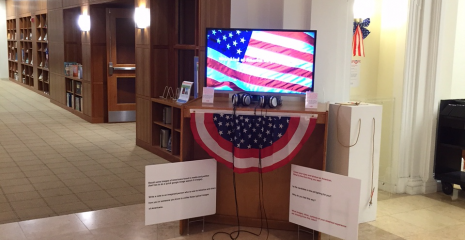 The work is titled “Vote Your Conscience,” a site-specific, interactive artwork that is part of the Ferguson Library’s contribution to the Aspen Institute’s “What every American should know” initiative. For this artwork, Livingston directed and produced a seemingly patriotic video with all the pomp of a political ad, but with only vague indicators of any real political messaging. A posted sign with questions for visitors accompany the video. These components are designed to intimate a perspective of privilege and aim to encourage passerby and library users to write potentially dissenting thoughts from each person’s unique perspective, including concerns about our country’s challenges and areas where it may fall short. The installation is on view starting October 26 and the comments left by visitors will inform a political speech that Livingston gives at the library on Saturday, December 3 from 3:00 – 4:00pm, followed by cocktails and coffee at Franklin Street Works. On November 17, Livingston, involved library staff, and curator, Terri C Smith, will have a public meet-and-greet/think tank coffee at Franklin Street Works’ cafe at 10:00 am to discuss the audience answers gathered at the project’s halfway point. “Vote Your Conscious” is, in part, an extension of David Livingston’s past public performances during his project “The Candidacy” where he ran for Alderman in New Haven and continues his exploration of the relationship between psychology and politics. David Livingston, who has exhibited nationally, works in sculpture and performance that include public happenings. He received his MFA from Pratt and is an adjunct professor at University of New Haven and Gateway Community College.